INDIANAPOLIS -- The second annual Indiana University-Purdue University Indianapolis Symposium on Civil Discourse will feature social entrepreneur Emily May, who has launched two initiatives to recognize and stop harassment wherever it occurs. The event, "Online, On Campus, and On the Streets: You Have the Right to Be in Public Space," is free and open to the public. 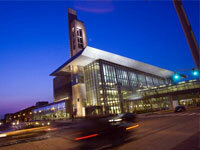 It will take place March 6 in the IUPUI Campus Center Theater, 420 University Blvd. May will deliver a keynote address at 1:30 p.m., which will be followed by a panel discussion at 3 p.m. The IUPUI Symposium on Civil Discourse seeks to present models for civility and civil discourse that engage the campus community in challenging conversations about issues and events impacting the campus, nation and world. In 2005, at the age of 24, May co-founded Hollaback! in New York City. The anti-harassment group brings together grassroots activists who work together to understand harassment, ignite public conversations and develop innovative strategies to ensure equal access to public spaces. The group has taken its expertise in combating real-world abuse to the digital world, creating Heartmob, which aims to be the place where those facing online harassment can easily report abuse across social networks and find support from others who know what they're going through. According to a Pew Research Center survey in 2014, harassment -- from garden-variety name-calling to more-threatening behavior -- is a common part of online life that colors the experiences of many web users. Fully 73 percent of adult internet users have seen someone be harassed in some way online, and 40 percent have personally experienced it. According to the Pew report, women and young adults are "more likely than others" to experience online harassment, and women are more likely than men to find their experiences of harassment "extremely or very upsetting." Online, women are more vulnerable to sexual harassment and stalking. May has a master's degree in social policy from the London School of Economics, is an Ashoka fellow and a Prime Movers fellow, and has won a number of awards for her work, including the TEDCity 2.0 Prize. Sponsors of the event are the IUPUI Office of Intercultural Literacy, Capacity and Engagement; the Division of Student Affairs; the Office of Equal Opportunity; the Office for Women; the Department of Psychology in the School of Science; and the Office of International Affairs.